An e-commerce website selling clothing and jewelry made by vulnerable women being paid fair wages. A healthcare company in Kenya that uses mobile technology to deliver healthcare to low income populations. A nonprofit that helps “in need” student-athletes prepare for college. These are just a few of the over 30 social ventures that Fuqua MBA students have worked with over the years through the Fuqua Client Consulting Practicum (FCCP). FCCP provides client organizations from around the world with the opportunity to engage a team of 4 – 6 select MBA students to address a range of challenges their venture is facing. Past projects have had a wide range of focuses, from scaling strategies to strategic planning and risk analysis to human resources and marketing. In turn, students have the opportunity to apply their skills, both from their career and classroom experience, to a real world project. “My MBA classes are where I learned the skills that can help me impact organizations. But FCCP was the place where I could really test that knowledge,” said Anne Steptoe (Fuqua MBA ’16) of her experience working with a healthcare organization during her FCCP project. Anne has since gone on to found MedServe, a “Teach for America for healthcare” program in North Carolina. I’m interested in having my social venture participate. What should I know? The application process for clients to be a part of FCCP is competitive. Client organizations can increase the likelihood that they will be chosen for student engagement by proposing projects that effectively utilize the skillsets of the MBA students. If a client organization is selected by a student team, the client will meet virtually with the team starting in November. Students will spend the fall (November – early December) working remotely with the client to hone in on a specific scope of work for the project. In the spring (late January – April), the team begins their work conducting research for the project. 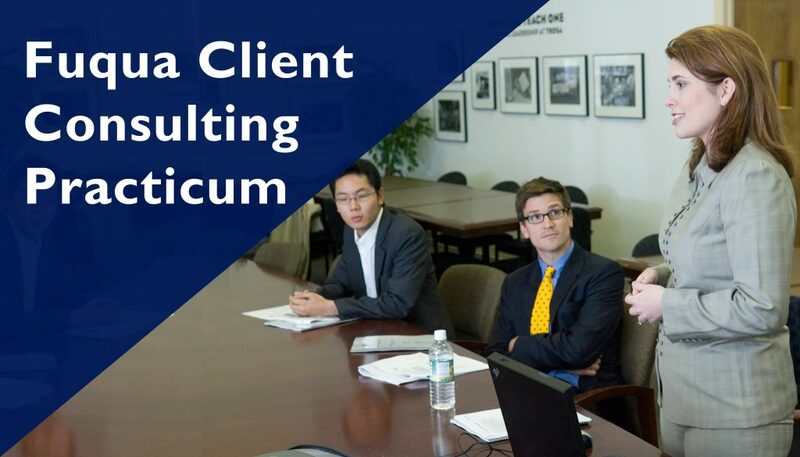 For international projects, students will visit their client in-person during the Fuqua spring break (March 5 – 19) to conduct interviews, perform site visits, and collect further information to inform their deliverables. By April teams will present their recommendations to their client. How can I ensure my project is successful? It is important that senior staff at your social venture be available and responsive to the FCCP team over the course of the project. This will help ensure that students have available to them the information and insights needed to provide actionable solutions for your project. Typically clients can expect that they will spend 2 – 5 hours a week with the FCCP team through the months of January – April (note: for international projects, expect significantly more time to be spent during students’ site visit in March). Since most work is done remotely, clients will need to have the ability to touch base with their team via methods such as telephone, Skype, web conferencing, and email. Clients must also be prepared to share relevant data and documents with the student team (students will sign a non-disclosure agreement). Applications are accepted through September 30th for the 2017-18 academic year. If a client’s project is accepted, they will be required to pay a fee for the program (More info here). Scholarships/fee waivers are available in some cases). You can find examples of past social ventures that were selected here. Anything else I should know before applying? After watching the webinar, if you still have questions on if your social venture is a right fit for FCCP, please email our Director of Programs Robyn Fehrman.